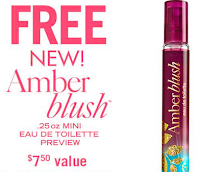 Head over to your nearest this weekend nad pick up a FREE Amber Blush (.25 oz.) Mini Perfume Sample. Just try print out the image or show it to the cashier at the register on your phone. This offer is valid this weekend only (September 6-9)! No purchase necessary! Limit one coupon per transaction. Coupon was be presented and surrendered at time of in-store redemption. Our exclusive Amber Blush fragrance captures the sensual warmth and luxury of a romantic getaway.